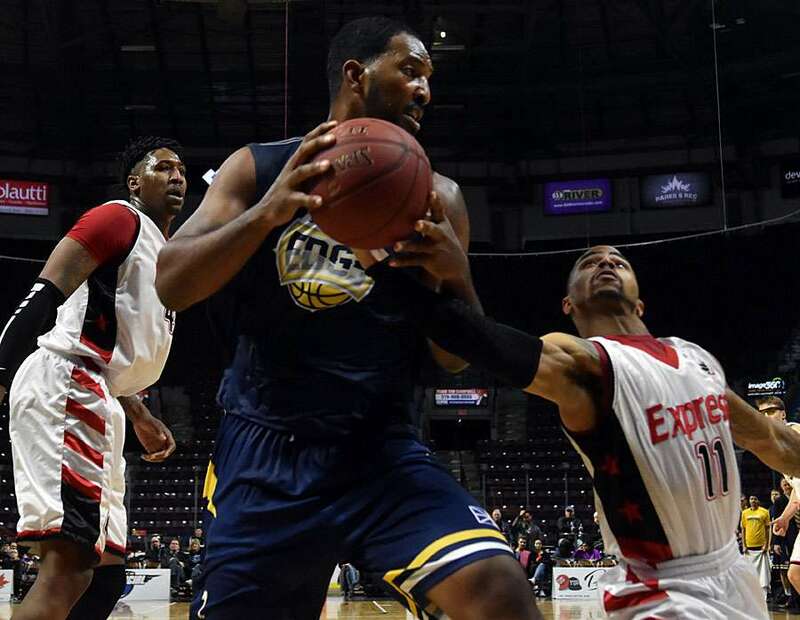 (WINDSOR, ON) – After twice defeating the Niagara River Lions by identical 112-110 scores last week, the Windsor Express scraped their way back to .500 for the first time since December 17. Buoyed by the key arrival of Omar Strong, the Express were scheduled to test their roster against the St John’s Edge for a Family Day matinee. Logan Stutz struck first for Windsor on a dish from Maurice Jones. Alex Johnson replied for St John’s and Charles Hinkle put up a three to move the Edge in front. Windsor earned their chances in the paint, but the rubber wasn’t dropping for the shooters. St John’s quickly doubled Windsor 14-7 with 7:39 left in the quarter. The aftermath of a media timeout saw the insertion of Strong into the Windsor lineup. The more than 2,500 fans showed their appreciation when Strong hit for three on his first attempt. The Express puled within a single point after a strong bucket and freebie by Stutz and then took the lead when Strong looped a shot from the high key. Timeout St John’s. By the end of the period, Windsor had extended their lead to 30-26 on the strength of 10 points from Strong off the bench, and 8 from starting forward Stutz. Windsor out-shot St John’s from the field 60% to 49%, including hitting 50% from beyond the arc. Hinkle had 7 points for the Edge. The Express gave up the lead early in the 2nd quarter as Hinkle and Carl English connected on trips up court Stutz returned the favour as did Chad Frazier from beyond the arc. The the fans were treated to a defensive rebound by an outmatched Jones who then went end-to-end for an acrobatic layup. Another 2 from Frazier prompted another Edge timeout with Windsor in front by 6. “I kinda anticipate and know what’s gonna happen before it happens,” said Jones. “I guess right most of the time.” Jones added 4 steals to his league leading 57 total on the season and 2.1 per game average. Returning to play, the Express extended the lead to 8 and then by 10 when Jones stole a pass for a half court quick break layup. Jones was also quick to a loose ball to feed Stutz for an easy bucket. Meanwhile, St John’s was finding it difficult to penetrate the Express defense and began to rely on long balls from English to stay close. At the end of the half, Stutz was officially 3-for-3 from 3-point range as Windsor enjoyed a 14 point lead 62-48. Two hard trips to the hoop by Shaquille Keith as well as a strong drive by Antoine Chandler highlighted the final 60 seconds of the 1st half for Windsor. Stutz added 10 points in the quarter to take the game lead with 18 to go along with 7 boards. Strong and Jones also logged double digit points for the Express while English led the Edge with 17 and Hinkle had 13. Windsor began the 3rd quarter with Keith dropping a freebie courtesy of an Edge technical. But Windsor didn’t have an answer to St John’s strong play and the teams ended the period with the Edge leading 91-89. The Edge began the 4th by extending their lead to 5 points. Windsor seemed unable to buy a basket as their shooting dried up early. Play got physical as the teams amped up their competition. Just 9 combined points were scored in the first 5:00of play. Both Strong and English ran into early foul trouble, accumulating 5 apiece and having to take a seat. A bucket by Keith cut the margin to 1 and then a foul put Frazier at the line. He completed 2-for-2 with 4:37 left to play. Two points by Johnson earned a Stutz triple in reply. Then former Express player Wally Ellenson dropped his own from outside. Windsor was looking from the wrong side of a 5-point deficit with under 2 minutes to play. Keith put two away from the penalty stripe to pull Windsor within 1, but Johnson ended the game with a jumper with 21.3 seconds on the clock. Though the fans still held out hope as the finals seconds ticked off, the Express couldn’t avoid the 112-108 final score. Windsor doesn’t have much time to work out he kinks as they host the division leading London Lightning Wednesday at 7:30pm.